Premium Black Magnetic Wall Chalkboard with Maprail. This Black Wall-Mount Chalkboard is constructed of Porcelain Enameled Steel. 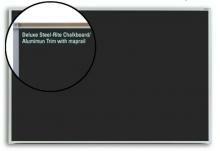 The black, heavy duty chalkboard surface is guaranteed by the manufacturer for 50 years. A durable Anodized Aluminum trim frames the magnetic chalkboard surface. A full-length maprail and chalkboard accessory tray is included. Choose your Chalkboard Size.